though thy quiver with the same music. And the oak tree and the cypress grow not in each other’s shadow." Tim/Heather, "you are my best friend and the one I want to share my life with. I will love you forever, and under all circumstances. I will be here to listen to you, laugh with you, and to hold you. I promise to be your friend, your love, and your partner forever." Fr. Ariosto - Will you, Tim, have Heather to be your wife, to love, honor, and cherish her so long as you both shall live? Fr. Ariosto - Will you, Heather, have Tim to be your husband, to love, honor, and cherish him so long as you both shall live? Tim - With this ring, as a token of my faith and symbol of my love, I take you as my wife. Heather - With this ring, as a token of my faith and symbol of my love, I take you as my husband. Fr. Ariosto - The ring is just a symbol of your marriage, symbolic of the fact that you have this day pledged yourselves in marriage, and as the ring is a perfect circle without end, it is the wish and hope of all that your marriage will be perfect and will be without end. Fr. Ariosto - "Now you will feel no rain, for each of you will be the shelter to the other. Now you will feel no cold, for each of you will be a companion to the other. Now you will feel no loneliness, for each of you will be a companion to the other. Go now to your dwelling place, to enter the days of your life together. And may your days be good, and long upon the earth." Fr. Ariosto - For as much as Heather and Tim have consented together in wedlock and have witnessed the same before these witnesses and thereto have pledged their truth, each to the other, and have declared the same by joining hands and by the authority vested in me, I now pronounce you husband and wife. Ladies and Gentlemen, Heather and Tim Rantz! 12) The Bride and Groom walk out and walk back for pictures. Tim’s family photos first, then Heather’s family, then Heather and Tim. Lita: Let us all rejoice today with BRIAN and MAIDA. In this celebration of love we are about to share, let us pray that they may start their new journey together with the blessings of God. All please stand to begin the celebration. Fr. Coelho: In the name of the Father, and of the Son, and of the Holy Spirit. Fr. Coelho: The grace of our Lord Jesus Christ, and the love of God, and the fellowship of the Holy Spirit be with you all. Fr. Coelho: My dear parents, family and friends, we are gathered here today to witness the beginning of a new life of togetherness for BRIAN and MAIDA. Let us unite our hearts and minds with them as we pray that joy and peace be theirs and remain with them all the days of their lives. Let us thank God for bringing them together and let us pray that He will bless and consecrate their life together in marriage. Fr. Coelho: Let us pray. Father, thank you for the gift of love that exists between BRIAN and MAIDA. Hear our prayers for them. With faith in You and in each other, they pledge their love today. May their lives always bear witness to the reality of that love. We ask You this through our Lord Jesus Christ, Your Son, who lives and reigns with you and the Holy Spirit, one God, forever and ever. Lita: Please be seated as we listen to the Word of God. Lita: Please remain seated. May we ask BRIAN C. and MICHELLE to light the candles. These burning candles symbolize the life that BRIAN and MAIDA will live together. Father, you are the light of the world. Bless them, so that they may be light to each other, and together, light to their children and friends. Fr. Coelho: My dear BRIAN and MAIDA, you are here today to seal your love with an eternal bond before the Church. I assure you of the prayers of our community that God may pour His abundant blessings on your love and help you carry out duties of the marital state. And you, dear brothers and sisters, may I ask you now to help them in your prayers and accept them as a new couple in our Christian community. And now, be reminded that it is not Fr. Coelho that will solemnize this marriage but you, BRIAN and MAIDA, for you will be the ones to express this love in the Sacrament. Fr. Coelho: BRIAN and MAIDA, since you wish to contract Holy Matrimony, Please join your right hands and express your intentions before God and His Church. Fr. Coelho: MAIDA, do you take BRIAN to be your lawful husband according to the rites of our Holy Mother the Church? Fr. Coelho: Do you give yourself to him as his wife? Fr. Coelho: BRIAN, do you take MAIDA to be your lawful wife according to the rites of our Holy Mother the Church? Fr. Coelho: Do you give yourself to her as her husband? BRIAN: MAIDA, today, I offer myself to you as your husband. Allow me to stay with you for the rest of my years. As your best friend, your confidant, as your lifelong companion. I will celebrate the wonders of life with you, laughing and loving, and will remain by your side, holding your hand whenever the days seem dark and bleak. I will honor you as my partner and equal in all things and help you our future children in an atmosphere surrounded by love and respect. I love you. I always have and I always will. I'm looking forward to a life with you, filled with joy and laughter and the occasional tear. I'm ready to love you all the days of my life. Now and forever, I promise to love you to the best of my abilities, to my dying day. Accept me as your husband and partner for life. MAIDA: BRIAN, today I offer myself to you as your wife. Accept me as your best friend and partner for all the remaining days of my life. I will rejoice with you in the face of life's glorious blessings and support you in the face of its greatest challenges. I will honor you as the head of our family and help you raise our future children in an environment of love and respect. Together, we will laugh and cry, listen and learn, give and forgive, live and prosper as two hearts and souls united in love. Accept me as your wife and partner for life. BRIAN and MAIDA: Grant us Father your guidance and strength to be one from this day forward. Knowing that we live in Your love, we will face the challenges and triumphs that lie ahead. We place ourselves and our lives in Your loving hands. Fr. Coelho: And I, by the authority of the Church, calling on all those present here as witnesses, confirm and bless the bond of marriage which you have contracted. In the name of the Father, and of the Son, and of the Holy Spirit. Lita: BRIAN and MAIDA will now light the nuptial candle. (BRIAN and MAIDA separately light their respective candles, then extinguish the light of the wedding candles. Together, they light the unity candle). The lighting of just one candle took place before all of us. 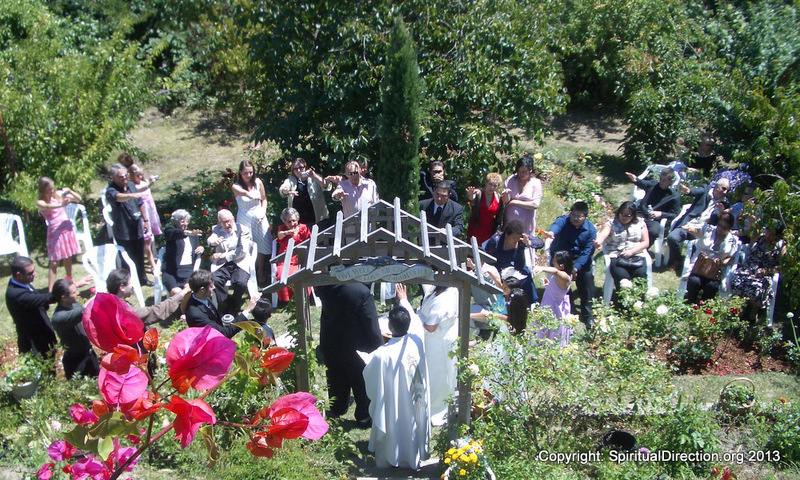 BRIAN and MAIDA entered the Church as two separate individuals. In the Holy Sacrament of Matrimony, they have now been joined by God and have become one flesh, one individual as it were. The flame is a symbol of God’s presence. From Him alone can be obtained abiding light and warmth, wisdom and love, hope and life, now and forever. Lita: May we now ask SEAN and CHIQUI, ZACH and ZEFF to please come forward. Fr. Coelho: Bless O Lord these rings so that your children, BRIAN and MAIDA who wear them, may remain faithful and loyal to each other, abide in your peace and favor, and live together until their lives end. Through Jesus Christ our Lord. Fr. Coelho: Now give these rings to each other. BRIAN: MAIDA, wear this ring as a sign of my lifelong love and fidelity to you. In the name of the Father, and of the Son, and of the Holy Spirit. MAIDA: BRIAN, wear this ring as a sign of my lifelong love and fidelity to you. In the name of the Father, and of the Son, and of the Holy Spirit. Fr. Coelho: We shall now bless your arrhae, which symbolizes the responsibilities of married life. We pray that you will live up to them, in God's will, throughout your journey together. Bless O Lord your children, BRIAN and MAIDA, with sufficiency of material possession which they may use to attain eternal life, through Christ our Lord. BRIAN: MAIDA, I give you this arrhae as a pledge of my total dedication to you and constant concern for your welfare, and those of our future children. In the name of the Father, and of the Son, and of the Holy Spirit. MAIDA: BRIAN, I accept your pledge. Likewise, I pledge my dedication to you and constant concern for you and for our future children. In the name of the Father, and of the Son, and of the Holy Spirit. Fr. Coelho: Brothers and sisters in Christ, we have just witnessed the solemn union of BRIAN and MAIDA. Let us now welcome them into their new life as husband and wife. Fr. Coelho: Let us pray with confidence to the Father in the words our Savior gave us. Fr. Coelho: My dear friends, let us turn to the Lord and pray that He will bless with His grace, BRIAN and MAIDA, who have come to His altar at the beginning of their married life. May they always be united in love for each other as they share in the Body and Blood of Christ. Father, give your blessings to MAIDA, your daughter. Give her the grace of love and peace. May she be a good wife and mother, faithful in love, generous and kind. May her husband put his trust in her and recognize that she is his equal, an heir with him to the life of grace. Father, give your blessings to BRIAN, your son. Give him the gift of love and peace. May he be a good husband and father, faithful in love, generous and kind. May he always honor and love his wife, as Christ loves His bride, the Church. Father, keep BRIAN and MAIDA always true to your commandments. May they praise you in their happiness and turn to you in their trials. May they be welcome at Your joyful feast in heaven. All these we ask, through Your Son, our Lord, Jesus Christ. Fr. Coelho: Lord Jesus Christ, You said to Your apostles, "I leave you peace. My peace I give you." May we, who break bread together in this joyous occasion, grow in Your peace and love. As you commanded, may we live together in the peace and unity of Your Kingdom, where You live forever and ever. Fr. Coelho: This is the Lamb of God who takes away the sins of the world. Happy are those who are called to His supper. Fr. Coelho: May the Body and Blood of Christ bring us to everlasting life. Lita: May we now ask HYON and LISA to remove the cord. May we now ask BRIAN S and TIARA to remove the veil. Fr. Coelho: Lord, in Your love you have given us this Eucharist to unite us with one another and with you. As you have made BRIAN and MAIDA one in this Sacrament of Marriage, so now we make them one in We ask this through Christ our Lord. Fr. Coelho: And may Almighty God bless you all, the Father, the Son, and the Holy Spirit. Fr. Coelho: Let us go in peace to love and serve the Lord. Fr. Coelho: BRIAN and MAIDA, you have pledged love, fidelity and welfare to each other and offered yourselves together in marriage to God. So before God and His community, I pronounce you are now husband and wife. Lita: May we request everyone to be seated until called for the wedding photos with the bride and groom. Barukh Ha-ba Beshem Adonai: Blessed be you who have come here in dedication to all that is loving, good, and sacred. Bairakhukhem Mi-bet Adonai: I bless you and welcome you in joy. Adonai Yevarekh et He-hattan v’Kallah: May the Source of all life sustain you…. We take this moment to recognize the joy of John's grandmother, Edna Flaxman, who could not travel to be here today. While we are here to celebrate this joyous moment… the celebration is not complete without…. In our thoughts are those who cannot be here….departed family members who are very much in our hearts…. John & Zahie would like to take a moment to honor and remember each of them. Reading 2 : "The Mad Scene"
Reading 4: "Letter to the Corinthians"
Two cups are before you. Only one is reserved for the two of you alone. You will share the first cup with those who have been partners in your lives thus far, the ones who have helped….. We are grateful to you, Source of All, for the loving care and teaching of parents, the ties of heart and mind and memory that link brothers and sisters…. Baruch Ata Adonai Elohenu Melech HaOlam Borei P’pree Hagafen. Blessed be the Eternal One, Our God, who creates the fruit of the vine. I, John, choose you, Zahie, as my wife. I pledge to share my life openly with you, to speak the truth to you in love; I promise to honor and tenderly care for you in sickness and in health, in joy and in sorrow. I pledge to you my respect and love. I, Zahie, choose you, John, as my husband. I pledge to share my life openly with you, to speak the truth to you in love; I promise to honor and tenderly care for you in sickness and in health, in joy and in sorrow. I pledge to you my respect and love. Fashioned without beginning or end, these rings represent the enduring love you have pledged one another. They are symbols of the continuity of your love. In keeping with the declaration…. With this ring, I join my life with yours. I offer it as a symbol of my everlasting love. You are my beloved and you are my friend. With this ring, I join my life with your. I offer it as a symbol of my everlasting love. You are my beloved and you are my friend. As you share this cup of wine, so you undertake to share all that the future…. Baruch Atah Adonai Elohenu Melech ha-olam Boray p’ree ha-gafen. Blessed be the Eternal One, Our God, who creates the fruit of the vine. As together you have partaken from this cup of wine, so may you in perfect union …. In the Jewish tradition, brides and grooms are blessed with seven wedding blessings. And now I ask you and all your dear ones to bow your heads in reverence. Silently let us pray that…. Y’va-reche-cha Adonai v’yish-me-recha: May the blessings of God rest upon you. Yah-err Adonai panav ay-lecha vee-chu-necha: May God’s peace abide with you. Yisa Adnai Panav Eylecha v’yah-sem lecha shalom: May God’s presence illuminate your hearts, now and forever more. When you break this glass….We recognize the end of your previous lives and the start …. opening yourselves to the blessings of the future …..
Once the glass is broken, I invite everyone to shout words of congratulations In the language of your choice. "Mazal tov!" which means "Good Luck" and "Much happiness." In Italian, this is Auguri. In Arabic, Mabrook. Fr. Coelho : You may Kiss. A WEDDING HOMILY: "My Beloved is Mine"
Alan and Karen, Your Dear Families, Friends and Well Wishers Assembled in this Sacred Church of St. Michael at Taleiganv on this Fourth Day of December (1993) When Heaven and Earth Witness the Harmonious Blending of Your Dreams for Each Other Through this Supreme Sacrament of Love: Matrimony! As I stand in front of you and look into the blank mirror of oblivion the following episode flashes on the screen of my consciousness. It is about a man who was forced to deplane while in mid-air. His parachute landed him on the branches of a huge tree. As he lay perched on its leafy branches he saw a ghostly figure dressed in white approaching him on a bicycle. Holding on to dear life he mastered enough strength and said "Excuse me Sir, can you tell me where am I?" The mysterious person quickly responded: "Certainly! Thanks be to God. You are stuck on the branches of a mango tree, about ten feet from the ground". The helpless prisoner of the tree angrily retorted: "You must be a clergyman, because what you say is absolutely true but altogether useless, irrelevant and impractical!" As a member of the Roman Catholic Clergy today, I am aware of my inadequacy in matters related to matrimony. Unlike the clergyman in the story, I hope my statements during this six-minute-homily are not only true and thought provoking but also useful, relevant and practical. As I look into your face and travel beyond the veneer of superficiality piercing that unprecedented radiance, which emanates from your heart and glows through your eyes right now, I can hear your question: "Ti Ariosto, can you tell me where I am?" Certainly, KAREN! You are lost in the WONDER OF LOVE, and the name of this "wonder of love" is ALAN, a name that spells HAPPINESS ! Your penchant for literature, I am confident, will awaken the poet in you to discover the beauty of life beyond those limitations and adversities which are unavoidable along the path to enlightened happiness. Permit me to share with you a vignette from Fr. Anthony de Mello’s last book of insights and story meditations entitled, One Minute Nonsense (1992). "If you search for God you search for ideas- and miss the reality," said the (Spiritual) Master. He then told of the monk who complained about the cell he had been given. "I want the cell from where I could contemplate the stars. In the one I have a stupid tree blocks out the view." Now it was while grazing at that particular tree that enlightenment had come to the previous occupant of the cell." - You may verify with your MOTHER about the veracity of this truth. As I look deep into the intimacy of that cell, which is your heart, and attune myself to those vibrations, which emerge on the surface of your body and of other bodies at the periphery of your life, I can sense the question: "Father, can you tell me where I am? ALAN, I am at a loss! for the name of the game is SURRENDER, "for in losing" says Christ "you find" that which you seek, KAREN! Your professional career, I realize, requires that you travel. You travel not only to organizations where your managerial skills and talents are profitably utilized, but also into conflicting situations where you are called to face new challenges. The path to enlightened happiness is the Supreme Challenge and to date there is no single organizational theory which has the monopoly over this adventure called MARRIED LIFE! Permit me to conclude this musing with yet another Minute Of Nonsense. "Why do you travel so little?" a reporter asked (The Spiritual Master). "To look into the face of just one person or thing every day of the year and never fail to find something new in it – that is a greater adventure by far than any that travel can offer," said the (Prophetic-Mystic in the) Master. May the prophet and mystic in you always find your greatest adventure reflected in the radiant face of your beloved bride and wife KAREN. As you embark on THE ADVENTURE OF MARRIED LIFE today, may the WORD OF GOD be a lamp on YOUR PATH TO LOVE AND HAPPINESS. May the prophetic and mystical radiance of God shine on your faces, on the faces of your children and of all those near and dear to you. May you discover and live the most appropriate messages in the readings which you chose for the Eucharistic Liturgy of this your Nuptial Celebration. May you experience the beauty and sweetness of "a seal on your heart, like a seal on your arm. For love is as strong as Death" (First Reading, Song of Songs 2:8-10, 14, 16a; 8:6-7a) - "MY BELOVED IS MINE AND I AM HIS." During this homily I’d like to dwell on this sentence from the Gospel of the day which reads, "AND THOU HAST MADE THEM EQUAL UNTO US". Three years ago a bi-racial and ecumenical couple, that met in cyberspace, walked into my office wanting to get married. The only question I asked them was, if Jesus were here today, would He bless your marriage? The bride-to-be paused, then very slowly responded, "He would give me a long sermon, and, then, bless our marriage." I quickly responded, "If Jesus would bless your marriage, then, who am I to withhold a blessing? Go home, listen to the sermon and put your house in order." Dear Friends, let us realize that it is Christ who hast made them equal unto us. My dear sisters and brothers assembled in this holy edifice to celebrate the Sacramental Union of Ida and George, I do not want to give you a long sermon, but I want us to ponder on the following question, "If Jesus were here today, what would He tells us?" This is how I would re-phrase my question, How hast He made them equal unto us. I have been privileged to officiate at hundreds of wedding ceremonies in ancient shrines, beautiful churches, awesome gardens, remote forests and serene beaches. I have prepared bi-racial and interfaith couples, young and old couples, but to this day I have not married a couple whose combined age is over 170, and I ask myself "Why did Jesus choose me for this privileged event?" How hast He made me equal unto them? An estimated sixty billion people have preceded us in the journey through human life. It has been reported that on October 12, 1999, the six billionth child was born on our planet. Statistics reveal that there are more women than men. Hence, today there are over three billion women and about three billion men. I wonder how of all these billions of partners to choose from Ida and George have chosen each other? Have you ever wondered about the magic that brings two people together to share life and intimacy? Demographics reveal that the elderly population over 80 is on the increase. Have you considered that the elderly, too, have that magic ability to share life and intimacy? How hast He made us equal unto Ida and George? Ida and George, let me conclude this homily with a message that I share with all couples in love. May your silence be comfortable. May you experience the height of intimacy in that silence. May you experience the depth of communication in that silence. May you experience God’s Holy Spirit of Love in that silence. If you do this your marriage will indeed be a happy one. And you’ll feel Nearer to God -incidentally, that’s the Communion Hymn the Bride chose for today. I wish you a VERY HAPPY MARRIAGE. May your silence be comfortable because He hast made you equal and you’ve been chosen to receive the prize: LOVE without end. "May your silence be comfortable. In that silence, may you experience the height of intimacy, the depth of communication and the powerful presence of God’s Spirit of Love that gives and forgives. If you do this, dearest Marushka and Rohan, your marriage will indeed be happy and a lasting one, and all near and dear to you, especially your children, will be happy. I wish you HAPPINESS AS A MARRIED COUPLE! VIVA!" It is indeed a great pleasure for me and for my wife Vivian to join the 1500 invitees and guests at Quinta Valadares. 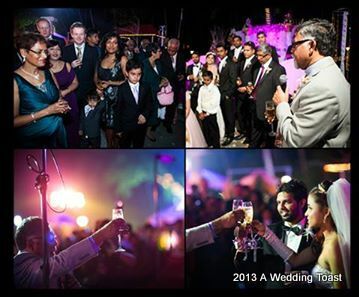 I feel privileged to have the honor of raising the toast to your wellbeing and wish you both a lifetime of happiness. Many years ago a religion teacher at Loyola High School in Margao asked an eight-year old Rohan: "What do you do at Christmas time?" Rohan addressed the class: "Well teacher, my sister Nadine and I go to midnight mass and we sing carols; then we come home very late. All excited, we go to bed and wait for Father Christmas to come with all our toys. "Very nice Rohan," retorted the teacher. A few years later in nearby Fatima High School in Margao another religion teacher asked the same question to young Marushka who replied with: "Well, teacher, me and my sister Nadia also go to church with Mom and Dad. We love singing carols and we get home ever so late. We hardly sleep, waiting for Santa Claus to bring our presents." "Well said Marushka," declared the teacher. Realizing there was a Hindu girl in the class and not wanting to leave her out of the discussion, the teacher asked, "Now, Shakuntala, what do you do at Christmas?" Shakuntala said, "Well, it's the same thing every year. Dad comes home from the office. We all pile into the Mercedes; then we drive to Dad's toy factory. When we get inside, we look at all the empty shelves and begin to sing: "What a friend we have in Jesus." Then we all fly to the Maldives for a week of fun. Well Marushka and Rohan, this Christmas you do not have to wait for Santa's toys. Like Shakuntala and her family you, too, can sing "What a friend we have in Jesus" and fly into each others' arms in a warm embrace of love that will last a lifetime. Dearest Marushka and Rohan, Your friendship with Jesus, I know, pre-dates your friendship to each other. I remember the day when Rohan was baptised and the Eucharistic Celebration on his First Holy Communion Day in the Navelim Parish Church. I presume that there were similar celebrations for Marushka. As I go down memory lane and travel along the stepping stones of your friendship I consider myself privileged to have the opportunity to share about the faith, hope and love as lived by you and your families. The Bride's late father was the popular musician JOSÉ JAIME REBELO, better known as James Rebelo. He was part of various musical performances with leading bands and performing artistes in Goa and New Delhi. Jaime was an ace Drummer and Percussionist, who was loved by everyone who knew him. He was very passionate about his village of Seraulim and about Goa. He expressed this passion in his promoting Goan and Konkani music. He also ran a popular Garden Restaurant called "The Picket Fence" at Seraulim, where Marushka grew up. The moving spirit behind Jaime was his beautiful wife VERA, who has brought up Marushka and her younger sister Nadia to be who they are today. Jaime and Vera descend from the Illustrious Families of Santa Catarina Coutinho e Rebelo from Seraulim and Betalbatim. The Groom's Family are descendants of Tipu Santu Naik-Sardessai, today known as the Coelhos of Aquem, and of the Canas of Betalabtim. My wife Vivian describes Rohan's family as "loving, big hearted, always willing to help anyone in need, including dogs." ROSARITO's and NIMMI's commitment to Youth and Families for Christ is both noteworthy and praiseworthy. I agree with my wife Vivian who describes Rohan as "a very gentle soul, possessed of no malice and eager to please all." A graduate in Fine Arts, Rohan possesses a vision for cars that led him to start, manage, edit and publish Goa's premier and only car magazine - AUTOBUZZ GOA. Marushka, I remember my first meeting with you in Rohan's open four-wheeler one night in Sarzora. I agree with my sister-in-law Nimmi, now your mother-in-law, when she describes you as "loving, affectionate, down-to-earth and patient." Endowed with these qualities your path to marital bliss is guaranteed. Well Marushka and Rohan, as you set out on your new journey to grow and glow as a married couple, I would like to share with you a few pearls of wisdom I was privileged to learn from and share with Rohan's grandparents on their Golden Wedding Day in Navelim in 1981, with his parents on their Silver Wedding Day in Aquem in 2006 and with your cousins from Panaji, Sarzora and Ecoxim on their wedding days. I would like to share with you the message I gave to Karen and Alan during the homily in St. Michael's Church in Taleiganv twenty years ago: "As you embark on the adventure of married life today, may the Word of God be a lamp on your path to Love and Happiness. May the prophetic and mystical radiance of God shine on your faces, on the faces of your children, and of all those near and dear to you. May you discover and live the most appropriate messages in the readings which you chose for the Eucharistic Liturgy of your Nuptial Celebration." I hope the message I shared with Blinston and Leandra in Verna six years ago is still valid. "May you learn that the reality of committed love for a married couple has three rings. It begins with the engagement RING, develops with the wedding RING and matures through suffeRING. As you take the driver's seat and drive though life may you learn to use these three precious RINGS appropriately: 1. engage all your individual strengths and qualifications to realize your personal goals and purpose in life; 2. blend your intellectual, emotional and spiritual resources to create a new family, may all your troubles be little ones; and 3. do not shun suffering, accept it as you would accept your shadow." A toast I made aboard a cruise vessel on the river Mandovi almost eighteen years ago to Leo, a Peruvian Bride from Japan, and her groom Karl went like this: "Arriba, Abajo, Al Centro, Va dentro!" [January 18, 1996] Rohan and Marushka , May you stay centered on the deeper reality inside each one of you as your experiences move you up and down and along the highs and lows on the spectrum of emotions. May you always choose to awaken, balance and center delight in the Light of Christ. By way of conclusion, I would like to thank the Almighty and Ever-loving Triune God for each of you, and request your families, especially Marushka's Dad and all the ancestors who are smiling from heaven, and all your friends particularly those assembled here on this hallowed night to raise the same prayerful toast I have shared with over a thousand couples throughout the world. May your silence be comfortable. In that silence, may you experience the height of intimacy, the depth of communication and the powerful presence of God’s Spirit of Love that gives and forgives. If you do this, dearest Marushka and Rohan, your marriage will indeed be happy and a lasting one, and all near and dear to you, especially your children, will be happy. I wish you HAPPINESS AS A MARRIED COUPLE! VIVA! A BRIDE'S PERSPECTIVE: "So then, what makes our Wedding Vows unique?" A COUPLE'S FEEDBACK: "Thank you for being such an important part of our wedding." A FAMILY IS GRATEFUL: "It means a lot that you have been a part of our spiritual lives."